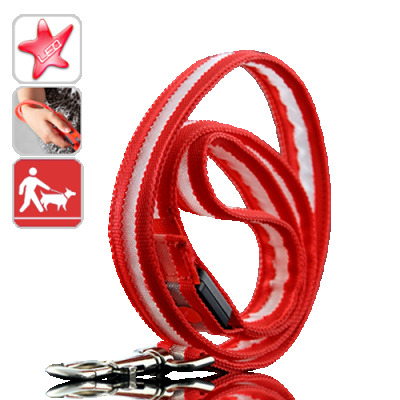 Successfully Added Red Optical Fiber LED Dog Leash (Water Resistant, Ultra Durable) to your Shopping Cart. Safely walk your dog in the early morning or late at night with this ultra durable and water resistant Red Optical Fiber LED Dog Leash. This light-up dog leash is easily visible up to hundreds of meters away and includes 3 modes (slow flashing, fast flashing, and constantly on) to make you and your dog safe and easy to find at night. Let cars, drivers, bikers, and even other people know exactly where you are to avoid possible accidents in the dark. It's also water resistant so you can take it out and use it rain or shine. Compared to other light-up dog leashes, this LED Dog Leash uses LED optical fiber light materials, making it the brightest on the market and with a longer life time than normal LED lights. The leash is also made of a high quality nylon weave that is strong enough to hold onto even the biggest dog. Even if your dog chews on it or claws at it, neither the leash nor the optical fiber light itself will be affected at all.